Some familiar favourites had disappeared and been replaced by the latest thrill rides of the day. The wooden Big Dipper at the back of the park had been removed, as had the Rotor, Satellite, Psycho double decker dark ride and the Pinfari Cyclone Roller Coaster which had been drafted in as a replacement for the Wild Mouse next door to the park's Casino arcade. The Astroglide had been moved from the front of the park to the former Big Dipper site but two new large gravity rides had been introduced at the opposite end of amusement area. Replacing the Cyclone was the larger Pinfari Jet Stream Coaster. 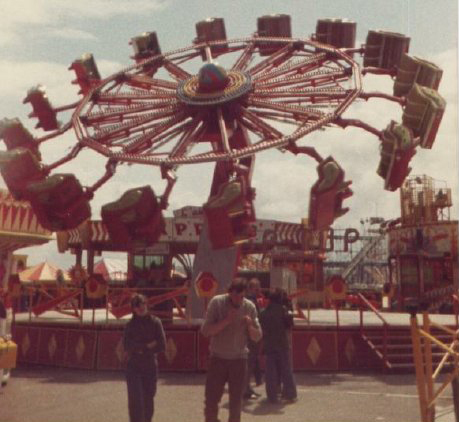 This had originally appeared at Battersea Park in the 70s as a replacement for the ill-fated wooden Big Dipper and when this park closed down the ride was transferred to Manchester's Belle Vue. Unfortunately Belle Vue - this once 'great day out' - also fell victim to the developers and a new home was found for the Jet Stream at Rhyl. The other gravity ride stood directly behind the Jet Stream; this was the Water Chute. 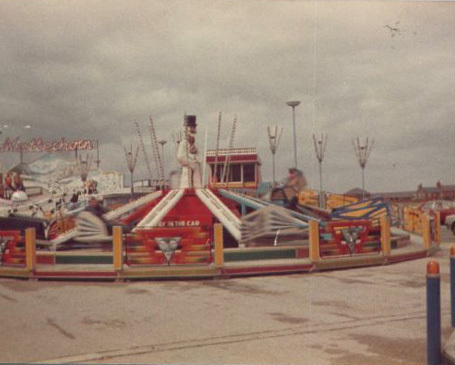 This ride had operated at Southend's famous Kursaal amusement park until the early 70s. You can still find this ride at Rhyl's park today - the only surviving example of this type of ride in the UK. [Note January 2010: this ride has now been removed and the key parts put into storage for use in the proposed amusement park of historic rides at Dreamland Margate]. 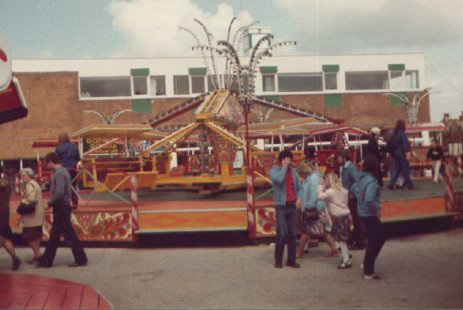 As well as these more permanent attractions many of the funfair rides had been replaced. Still going strong from the early 70s were the L'Amour Express, Waltzer, Skydiver (lifting paratrooper), Dodgems, Gallopers, Go Karts, Ghost Train, Fun House and Mirror Maze. However the old Bennet Twist had been replaced by a more modern Pollard-built Cyclone Twist. This still had a wooden floor but was much more open than it's predessesor with the cars having canopy hoods over them, in an attempt to protect riders from the extremities of weather during the holiday season. Another new addition was an updated version of the Flying Coaster called the Ski Jump. 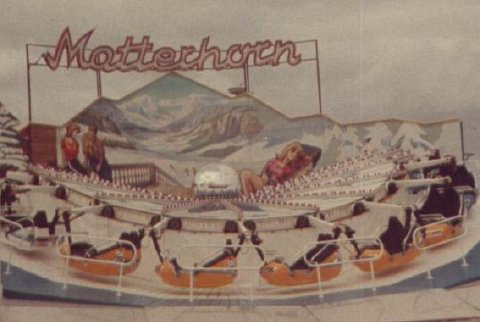 A Reverchon open topped Matterhorn debuted at Ocean Beach, Rhyl in 1980. You seemed to go virtually upside down as the cars raced over the ride's hills. While these were all new spins on old favourites there were a number of brand new novelties. The Swingaround used hydraulics to send riders flying in and out of its spinning frame while the Orbiter had six arms which had groups of cars tipping at angles as the whole structure spun. Another newcomer was the Tip Top, originally a 16 car ride; the entire ride would spin then lift at an angle before making a second lift so riders were spun horizontally in mid air. Following an accident all these type of rides were recalled and became 12 car versions. Other new arrivals included an Astroliner - a rocket simulator, which I was never really impressed with and only recall that it always seemed to smell inside the rocket when the door were closed for take off. In addition there was a Cinema 180 and Rock-o-Plane, or big wheel with caged cars that you could revolve through 360 degrees. 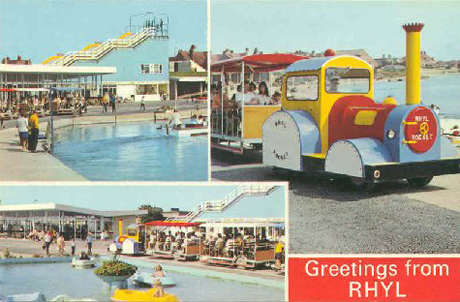 Postcard of Rhyl from the 1980s, showing the remaining rides and attractions available at the site of Rhyl's first main amusement park: Marine Lake. The Cyclone Twist at Rhyl. The Ski Jump at Rhyl. 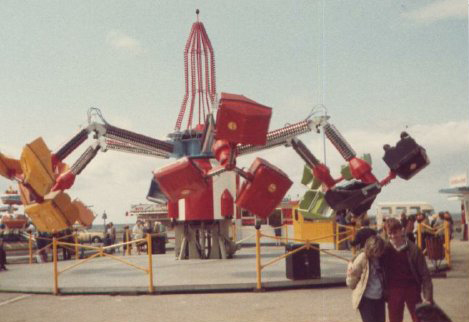 The Matterhorn at Rhyl in 1980. The Tip Top at Rhyl.